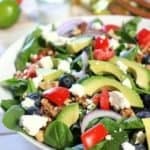 This beautiful and fresh Spinach Salad is a powerhouse of good taste and will leave you feeling like a million bucks! 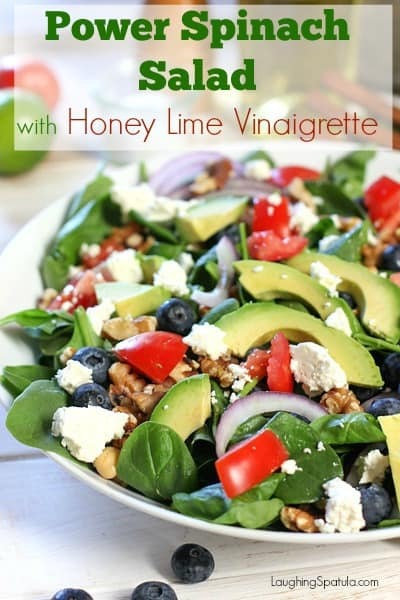 Fresh and easy ingredients tossed together in a quick Honey Lime Vinaigrette. The power of spinach! It is considered a ‘super food’ and and a great way to get your healthy greens in, especially for those of us who are not lovers of kale. (Kale will always be a garnish on a deli tray to me). I picked up this fresh spinach at my local Sam’s Club. Spinach is the ‘Super Food of the Month’ in the Sam’s Club on-line magazine, Healthy Living Made Simple. It made me feel okay about the lack of kale in my life! Its fresh, its fast and it tastes really really good! Oh and look, leftovers for lunch! Yay! I like to make a big old batch of this on Mondays….makes up for saturday and sunday indulgences. You can add chicken, fish or chilled shrimp for a whole meal and eat this for days. By the time Friday rolls around, you are back in your skinny jeans! 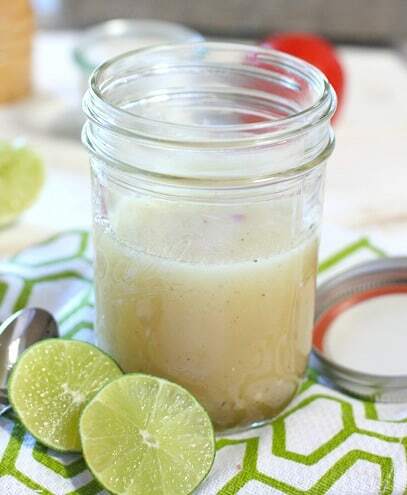 The dressing is so easy and you can sub lemon for lime in a pinch. It keeps your avocado green and makes enough for that most important lunchbox all week! I know if my fridge is full of healthy choices, I am less likely to eat a pizza….unless it has spinach on it, then that would be okay right? To a happy and healthy week! 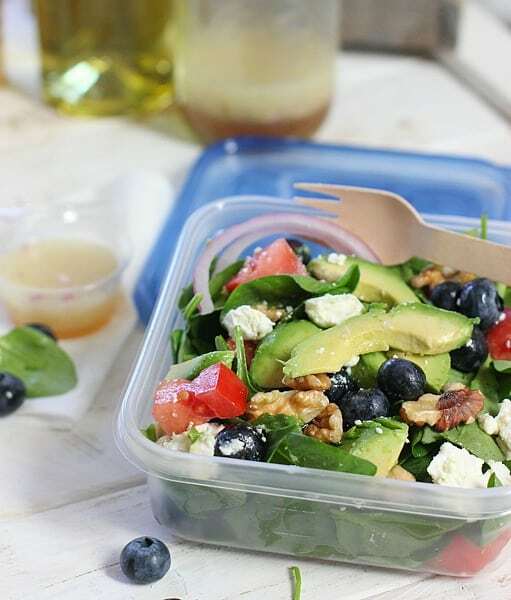 Another great salad that also works great for your lunchbox! ”Crunchy Mediterranean Couscous Salad! And Fresh Corn and Avocado Salad that uses the same Honey Lime Vinaigrette! A two-fer! A fresh and fast delicious salad that comes together in a flash. Perfect for dinner one night and lunch for the next two! Combine salad ingredients in large container or salad bowl. Toss only the amount of salad you will be eating right away. Save the rest for your lunchbox and serve the dressing in a separate container. Combine vinaigrette ingredients in jar or container with tight fitting lid and shake. Store in fridge. Toss only the salad you are eating. Spinach wilts fairly quickly. I want to make this for mother’s day tomorrow. Guessing one 5 oz.bag of spinach would be good? Oh jeesh! You are right! I recently changed to a new recipe card system and some of the ingredients went missing on a few of my recipes! I have updated. 6-8 cups or about a 1 pound bag. Thank you so very much for the note!!! I can’t wait to try it tomorrow! 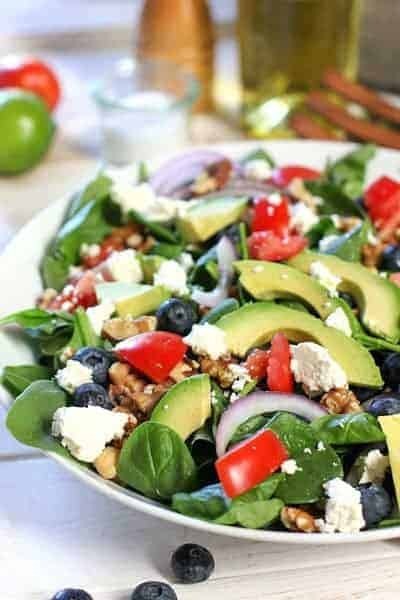 The perfect Summer Salad! Love your combination of ingredients. Thanks for sharing! This looks like a delicious and healthy salad. Perfect for using fresh summer produce! What a fantastic salad. You can’t go wrong with spinach and feta combination. Love it! We always have baby spinach in our fridge but I usually don’t put avocado with it. What a great idea. It sounds wonderful and I also like the dressing you’ve chose. Thank you for sharing. What a brilliant salad ..have all the ingredients in my kitchen, can’t wait to make it.